That question has to be asked of Khairul Anwar Rahmat! This is possibly the sixth or seventh time that he has come to Sydney. 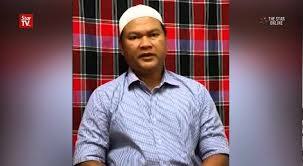 Come to Sydney to visit Sirul Azhar Umar in detention in Villawood. The same Sirul Azhar Umar who murdered Altantuya. Yes as you read this posting on this Saturday morning, Khairul would, in all probability, be meeting with Sirul Azhar Umar in Villawood. 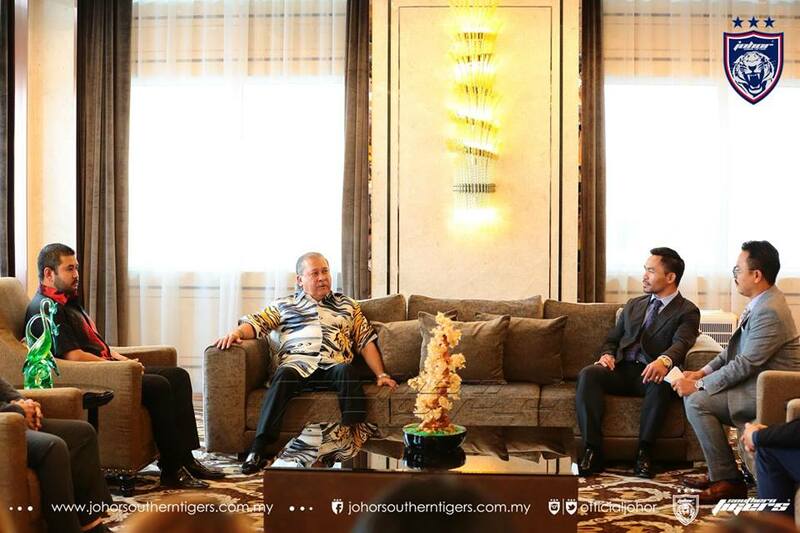 Yes that is Khairul Anwar Rahmat sitting at the extreme right of the above picture with the TMJ, the Sultan of Johor and Manny Pacquiao at His Majesty Palace in Johor Baru. That was last week. This weekend, he is visiting Sirul Azhar Umar in the Villawood detention centre. This is not the first time he is visiting Sirul in Villawood. He has done so at least five times in the last two years or more. Why? Did he say he is President of Sukaguam? The Malaysia’s volunteer Lawyers Association? The NGO that provides legal aid for those in need? Pertubuhan Sukarelawan Peguam Malaysia atau singkatanya SukaGuam merupakan sebuah pertubuhan yang terdiri daripada para peguam yang memberi perkhidmatan guaman / undang-undang kepada rakyat Malaysia di dalam dan luar negara. Kebanyakan mereka memberi nasihat undang-undang secara percuma, jika memenuhi beberapa kriteria. And that he has been visiting Sirul in Australia to do just that? Provide him with legal aid? Let me ask Khairul this question : What NGO providing legal aid would fund its president to visit a detainee in Sydney, Australia five or six times in order to provide that detainee with legal aid? Each visit to Australia would cost around RM10K x 6 times = RM$60K (Sixty thousand Malaysian Ringgit!). That is a lot of money for any NGO to spend on a convicted killer….or did Khairul Anwar Rahmat used his own funds for those trips? Again the same question ; WHY? What legal aid/advise has he provided Sirul with? Sirul already has three sets of Lawyers : One in Kuala Lumpur and two in Sydney. Is Khairul/SukaGuam funding all three? Was not Khairul the guy who organised the “Nothing to Hide” “get together” between Mahathir and Najib? Would some one who did not know Najib be able to get Najib to agree to attend the “gathering” So the question to be asked : Is Khairul a Najib operative? Is Khairul a Najib man looking after Najib’s interest anywhere he went….Villawood in Sydney included? Did not Sirul do a video to exonerate Najib of all blame of the Altantuya murder? Who “persuaded” Sirul to do those videos? How was Sirul persuaded? Who prepared the script for Sirul? Where did Sirul get the money to buy the expensive smart phone he has used to make the video? Who smuggled the money in? And after the video was made what changed for Khairul? Did he not buy a Five star Hotel in Malacca? Did he saved the money from small or was the money borrowed from some bank? Which Bank and how much was borrowed? When was the Hotel bought? Before or after Sirul made the video exonerating Najib Razak How many of the trips made by Khairul to see Sirul were made before the video was made and how many trips has Khairul made to see Sirul after Sirul made the video? And today…why is he in Sydney ? To see Sirul Azhar Umar again? And is he off to Canberra too to meet with those on whom he has relied upon to inform him on who is visiting Sirul from time to time? And is it Khairul who decides on who can meet with Sirul and who cannot see Sirul…or is it the Department of Immigration and Border Patrol in Canberra that decides these things? There are still many questions I want to ask this Khairul…but suffice for me to say that when the President of SukaGuam visits a convicted murderer in Australia, you just have to wonder why he is doing so. I have my suspicions but this Khairul is a Lawyer…and I must tread softly and carefully lest he throws the legal book at me. Khairul has been on the Sirul case from the time Sirul was arrested over two years ago…and he still is today. He is like a pit bull : once he latches on to a business opportunity…opps sorry that was a misprint…once this Khairul latches on to a legal case where he thinks he can do some thing for himself…opps wrong again….when he thinks he can help the detainee…this Khairul does not let go! Syabas bother..
Until the next posting from me that will examine a few other things happening between Sirul and Khairul…and Khairul and the other two Datuks involve in Sirul’s case and between Khairul and Najib and Khairul and etc etc….let us say for now …Hasta La Vista baby!